The Woods River system is a remarkable wilderness resource. It’s vast, over 100 miles long from its source - a myriad of headwater creeks flowing into the three feeder streams, then on into the main river with more than a dozen brawling rapids. It’s wild, patrolled by bald eagles and ospreys, habitat for mink and otter, sustenance for caribou and black bear, and fertile home to big cold-water fish. Every day you'll share this land with only your guide, your fishing buddy, and the thriving boreal landscape. It’s alive, with mayflies, caddis, stoneflies, and the various stages thereof; dace, darters, sculpins and minnows, fertile hunting waters for the predators: brook trout, northern pike, and lake trout. Brook Trout are strong, classically-proportioned river fish, beautifully colored in June, neon bright by August. True trophies, they average 3 - 4 pounds and run up to at least 10 pounds. Northern Pike inhabit the flat waters - lakes, ponds and broads of the rivers. The absolute top of the food chain, pike average 8 to 10 pounds and we’ve landed 25 pounders over four feet in length. Lake Trout dwell in the dark holes of the lakes in summer. By mid-August, they are found cruising the shallow shoals and coves. Lakers have an exceptionally long life span and get just as big as they want! We fly fish for brookies with 6- to 8-weight fly rods, barbless hooks and strong leaders. We take the greatest care with every brook trout caught and we release them all to maintain the natural balance or our ecosystem. Anglers who want to commemorate their trophies with carved mounts take measurements and an image. We can recommend accomplished artists whose reproductions are near perfect. Giant pike and lakers inhabit the many lakes and wide reaches along the watershed and provide extraordinary fly-fishing as well. Both species are great sport on the long rod, and our rules allow spin fishing with single, barbless lures only on the flat waters for pike and lakers. The Woods River proper is a fast flowing, freestone river broken frequently by lakes, ponds and broad reaches. Its numerous sets of rapids vary in length from 100 yards to almost a mile. In these rapids brook trout concentrate on feeding stations throughout the season. The rapids offer a diversity of haunts and holding water; plunge pools, riffles and runs, large boulders, creases and willow-lined undercut banks – a river fisher’s paradise. Feeder streams are too numerous to count. Some provide sanctuary for the smaller trout, but many hold the big boys. We get our name from the three main feeder rivers, Rick’s Run, Eagle river and Victoria River, which form the headwaters of the Woods. Each of these flows wanders some 20 or 30 miles out of the spruce and tamarack forests and offers spectacular scenery and holding water. In the three largest lakes, Crossroads, Vezina and Knox, mighty northerns and lakers sulk in the coves and spring holes. Successful fly angling at Three Rivers Lodge begins with your guide. Our guides are hand-picked by manager and head guide Kevin Barry. Each is an affable and engaging professional who has dedicated his livelihood to the ways of the wilderness. All guides are highly proficient in handling small boats in varied waters and are licensed to do so by the Province of Newfoundland and Labrador. All staff members train and are current in First Aid and in CPR as required by the Province. Kev and his guides are “Newfies” and Frenchmen, all self-reliant outdoorsmen, and their laughter, stories and friendship on the water and around the dining table will be the highlight of your visit. We keep a DeHavilland Beaver float plane down at the camp’s dock and use it every day to move our guests about our expansive river system. We fly the longer legs in the floatplane to fisheries where freighter canoes are stashed along the riverway. We also use the Beaver to discover new remote waters and fishing opportunities for our guests. Two fly outs per guest are included in your week to destinations such as our Fifth Rapids Outpost Camp, the headwater rivers for treks into the deep wilderness, and to the lower rapids where the big fish migrate out of the Smallwood. We have a small fleet of Lund “Alaskans” and square-sterned canoes powered by Honda four-stroke outboards. Each is well maintained and equipped with all safety items. We also have smaller canoes cached in remote locations for backcountry trekking. It is simply impossible for first-time guests to imagine all the angling possibilities at Three Rivers Lodge. Once in camp, manager Kevin Barry works with each group or single angler to determine their expectations and preferences and to then ‘customize’ a week of fly-fishing. We have all the tools – extensive waters, float plane, a wide range of watercraft, outpost camps, boondocks, and most importantly, the desire to recognize your angling dreams and the imagination and experience to guide you to them. 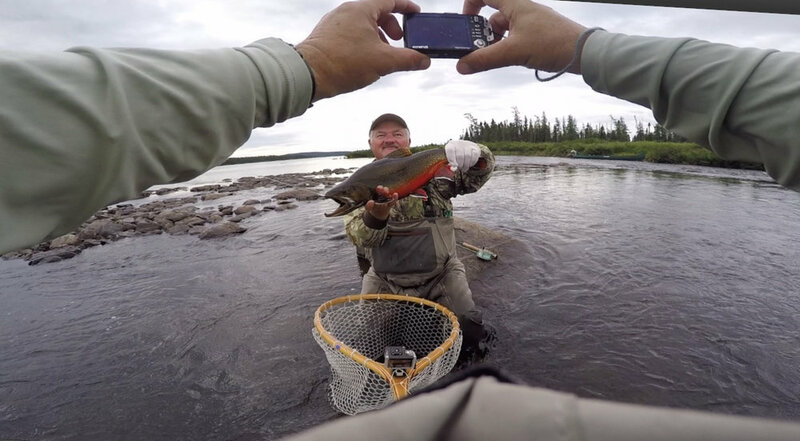 Annually, our fly-outs for Arctic Char are favorites among our new and returning guests, in large part due to the spectacular environs where these species thrive. Though char are not indigenous to our river system, we run one or two fly-outs each week for these powerful fish into totally untouched waters deep in the wilderness. Landlocked salmon appear late in the season and we have a couple of neat locations where guests can find them in late August.